After a pretty hectic British Grand Prix qualifying session, we thought we’d take a look at the talking points from Saturday afternoon in Silverstone. With 21 cars taking part in the session due to Marcus Ericsson’s enormous shunt in FP3, there was an incentive of only having to beat five people to progress to Q2, rather than six. The mad dash to get a lap in in Q1 proved interesting, but it didn’t go quite how some would have liked. Without further ado, here are our talking points. Corner cutting/exceeding track limits were one of the major themes of the qualifying, with several drivers gaining advantages and subsequently having their times deleted. Despite a lot of drivers running wide at Luffield, it was noted by Nigel Mansell that only Turns 9, 15 and 18 were going to have a zero-tolerance policy because those are the places where running wide is most beneficial. To those in the know, that’s Copse, Stowe, and Club. Several drivers had times deleted by the eagle-eyed Stewards, or as I like to call them, the Copse Cops. Anyone with four tyres over the white line got their time deleted, including many big names. Fernando Alonso did well to get into Q3, but his ninth-best time was omitted after he was found to have run wide. Lewis Hamilton, of course, is the man we speak of, and as many were right to point out, his first Q3 lap was three-tenths up on Nico Rosberg. The only problem is, he ran wide at what used to be the first corner of the track, Copse. That incurred the wrath of the Stewards, and his provisional pole lap was also deleted, leaving him tenth and last in the session with just two minutes to go. If you’re reading this, you probably know that that’s not how things ended up, but with the disappointment of Q1 for British fans, it must have been a heart-racing moment. The Raik choice after all? Many were confused yesterday when Ferrari announced that Kimi Raikkonen had signed a year’s extension at the Scuderia. Clearly, this is not the Kimi of old. He’s not quite as fast as he used to be, and a couple of years ago, it looked like he wasn’t bothered anymore. 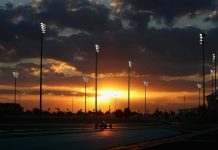 However, with Red Bull locking out row two of the grid with some serious speed, Ferrari had to claim the best-of-the-rest-of-the-rest accolade, with row three – crucially, Kimi was ahead of Seb, even before the four-time champ’s penalty for a new gearbox. Speaking of the Red Bulls, Max Verstappen’s P3 lap was mega too. It might have been a second off the Mercedes cars, but out-qualifying Ricciardo is some feat. With track limits the clear theme of Qualifying, the order was bound to shuffle around as times got deleted and drivers were dropped down. Jenson Button took a gamble of not going out at the end of Q1, which was a bit of a daft move for one of the three British drivers at their home race. When Q2 ended, it the McLaren man was in 17th place, and eliminated from the session…or was he? Race control popped up to say that Kevin Magnussen’s time had been deleted. Jenson duly jumped back in his MP4-31 to tour rural Northamptonshire once more… but it was not Magnussen’s best time that had been deleted – rather his second lap, which was slower than the first. After much confusion, it transpired that Jenson was the man dropped from the session rather than K-Mag; perhaps in some way a small victory for Magnussen after being dropped for the 2015 season. As has been the case in F1 a lot in the last couple of years, Rosberg v Hamilton is the battle to watch. Silverstone was no exception. In Q3, Hamilton set the time to beat, but it was deleted, as we know, for track limits. 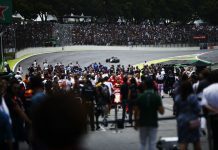 Rosberg plugged in a quick one, and then Hamilton bounced back in the dying embers of the session – effectively his only lap – to seize an epic lap. His time of 1.29.287 sent the home crowd into a frenzy, but it was actually marginally slower than his lap in Q2, which was a 1.29.248. That’s over THREE SECONDS (3.005 to be precise) quicker than pole position last year. Three seconds. In a year. That’s what you call progress! The race tomorrow promises to be a classic, with two tantalising team mate battles in the first two rows of the grid. Can Jenson Button climb through the field to score points? How Will Manor do after their first points of the season? Will Marcus Ericsson’s car be fixed in time? Do Sauber have any spare parts?